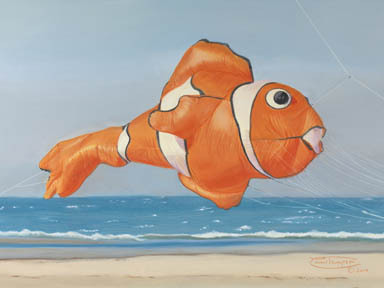 "'A Flying Clown' fish kite floats over the beach on a sunny summer day." Artist comment: "The kite festivals I have attended have always offered an opportunity to witness innovative and unique creations. On one such occasion, I was awed and inspired by a large, colorful 'clown fish'. Of course I knew I would add this kite to my painting repertoire! After thoroughly researching the kite, I went home and painted it with pastel on Canson Mi-Teintes textured paper. The best part (and challenge) was indicating the sunlight on the shiny fabric." "A Flying Clown" is a limited edition, giclée print from an original pastel painting by Carol Thompson. The edition includes 3600 authorized, signed, limited edition prints (3500 numbered and 100 artist proofs). Release date is July 2014. Image size and substrates vary. All prints are signed and numbered by the artist and include a certificate of authenticity. Paper prints are shrink wrapped on foam board. Canvas prints are coated with a protective spray.